Hi everyone, welcome back to weekly words holiday edition. In Korea, we have a special holiday about snacks which is November 11. Do you know what it is? 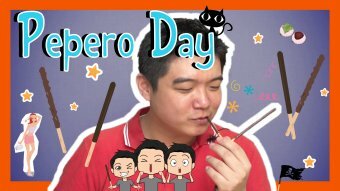 In this video, we will be talking about the holiday Pepero Day which is about the snacks. 빼빼로 데이 (ppaeppaero dei) Pepero Day. Do you know the reason why November 11th is called Pepero Day? That’s because of the snacks like the snacks are called Pepero. It looks like chopsticks and when you think about the actual numbers of November 11 which will be 11 and 11, it looks like this like 4 Pepero in a row. So the company made these snacks Pepero and they started celebrating November 11th as Pepero Day so that people can buy more snacks and now it’s become very popular nationwide. So people buy the snacks Pepero on this day and give it to someone you love. So with that word, you can say 빼빼로 데이에 사람들은 빼빼로를 선물로 줍니다. (Ppaeppaero deie saramdeureun ppaeppaeroreul seonmullo jumnida. ) which means that on Pepero Day, people give Pepero as a present to the other people and eat it. So Pepero is the name of snacks you know which looks like this and usually in one box, there are like 20, 25 sticks with the chocolate covered. With the word Pepero, you can say 빼빼로 데이에는 상점 밖에서 빼빼로를 파는 곳이 많이 있습니다. (Ppaeppaero deieneun sangjeom bakkeseo ppaeppaeroreul paneun gosi mani itsseumnida.) which means that there are lot of places selling Pepero outside the shop. That’s good. 사랑을 고백하다 (sarangeul gobaekada) Confess one’s love. 사랑을 고백하다 (sarangeul gobaekada) confess one’s love. It’s called a special day. I think people love this Pepero Day because they can confess their love or they can do something special for those whom they love. If you have someone who you really want to confess your love and if it is in November, November 11th will be the best day because you don’t have to buy a big present. You just have to buy a box of Pepero or some kind of special box with the heart shape and just give it to someone whom you love 사랑을 고백하고 싶으면 빼빼로를 주세요. (Sarangeul gobaekago sipeumyeon ppaeppaeroreul juseyo.) If you want to confess your love, give Pepero. I like this word because it’s kind of conjugated like 주다 (juda) means to give and 받다 (batda) means to receive. So to give, to receive became to exchange. 주고받다 (jugobatda) to exchange 빼빼로 데이에는 많은 사람들이 빼빼로를 주고 받습니다. (Ppaeppaero deieneun maneun saramdeuri ppaeppaeroreul jugo batsseumnida.) which means that a lot of people exchange Pepero on Pepero Day. 초콜릿 맛 (chokollit mat) Chocolate flavored. So I have this chocolate flavor Pepero. This is very traditional type of Pepero like it’s coated with chocolate and also there are a lot of different types of Pepero too actually like one popular version is 딸기 맛 (ttalgi mat) strawberry flavored which is pink and also the one that I really like is the one with Almond, very tasty. If you haven’t tried it, I recommend you to try the one with almonds. So with that word, you can say 빼빼로 데이에 가장 인기있는 빼빼로는 초콜릿 맛 빼빼로입니다. (Ppaeppaero deie gajang ingiinneun ppaeppaeroneun chokollit mat ppaeppaeroimnida.) the most popular Pepero on Pepero Day is the chocolate flavored Pepero. Okay that’s all the words about Pepero Day, the special day about the snacks. Have you ever got any Pepero on Pepero Day? Leave us a comment in Korean. I will see you next time 다음 시간에 뵙겠습니다 (Daeum sigane boepgetsseumnida) 안녕히 계세요 (annyeonghi gyeseyo).